Sundance Film Festival Premiere: I always feel that film festivals, wherever the location, are a good time to experiment. 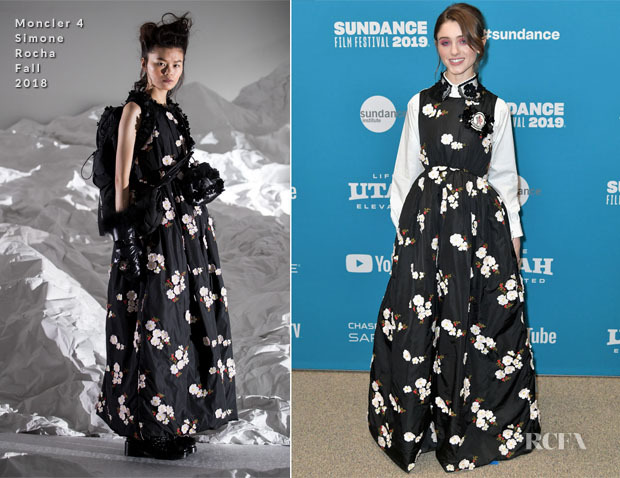 This Moncler 4 Simone Rocha Fall 2018 dress styled with a lace collared Moncler 4 Simone Rocha shirt, sees Natalie play down the vintage feel of this floral dress with bold eye makeup for a truly modern finish. LA Premiere: On this occasion she made an ultra-feminine impression in Oscar de la Renta’s white lace midi dress flourishing with florals. The classic design is cut with a fluted skirt, creating an undeniably flattering silhouette. Perfecting the look with a striking red lip and bow accented Louboutins, she was channeling unbridled elegance.